Take a high-speed train. It’s relatively fast from any major city in northern or eastern China, and the train station in Qufu is small enough that there’s not much of a crowd when you arrive. Be sure to book your car to your hotel in advance. Finding taxis can be a challenge. The nicer hotels aren’t located in the city so if you’re staying in one, strap yourself in for a bit of a drive. But don’t worry, unlike in China’s major cities, there’s not that much traffic and the drive is a scenic one of local farm life. A couple of days is enough to see the sights. When it comes to tour guides, stick to professional companies. Just like in any other city in China, don’t hire local guides on the street. They tend to be more expensive and will try to take you to shops and restaurants where they get a commission on your purchases. If Qufu is known for one thing, it’s that it was home to the great Chinese philosopher Confucius. 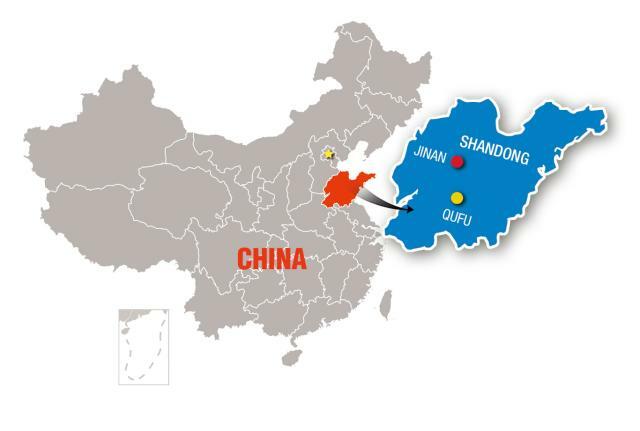 Qufu, located in the southwestern region of Shandong Province, gave rise to the greatest teacher in the history of China. Confucius, or Kongzi, lived from 551-479BC and has imprinted his philosophy into the minds of politicians, emperors and regular Joes (or Zhous). So what made his beliefs so special? Confucianism was developed with the emphasis on family and social harmony rather than special values like Buddhism and Taoism. Its core values were created to educate people into becoming the better version of themselves, something achievable and tangible. During his lifetime, Confucius served as a politician, philosopher and most importantly, teacher to the political elites and royal family of China. His popularity led to the rise of more than just scholarly wisdom. Today, the city thrives around everything Confucius. I have to be honest, before I actually went to Qufu, I wasn’t sure what to expect. But I left pleasantly surprised and mentally detoxed. So, what’s there to see when visiting Qufu? Everything you’d ever want or need to know about Confucius. There are three Confucius sites there – the Temple of Confucius, the Confucius Mansions and the Cemetery of Confucius. Collectively these three make up a UNESCO World Heritage Site known as the Three Confucius Sites or San Kong. Local tour guides will always try to sell you on all three locations as a package. 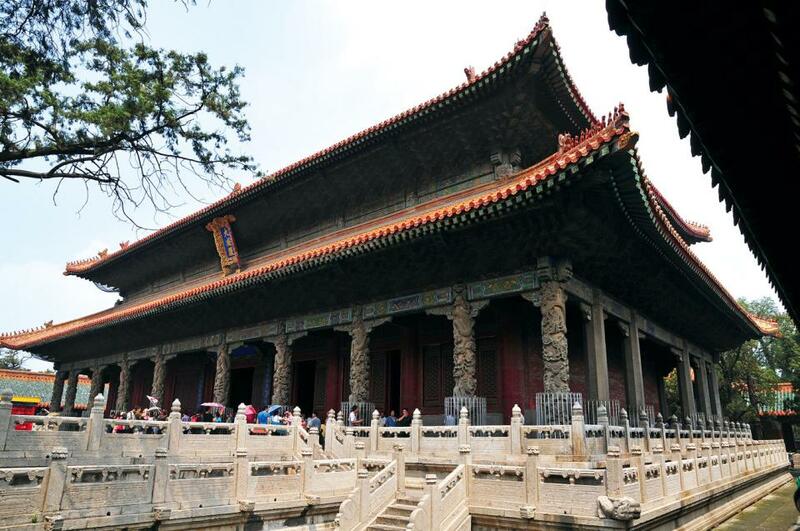 Built two years after the death of Confucius, the temple was created on the site of his former residence. Talk about respecting your teacher. At the time of construction, the Temple of Confucius was the only building to contain elements that were reserved for the emperor. This is one of the reasons that makes the Temple of Confucius historically interesting. To protect the temple, a wall modeled after the Imperial Palace was built around the entire compound. 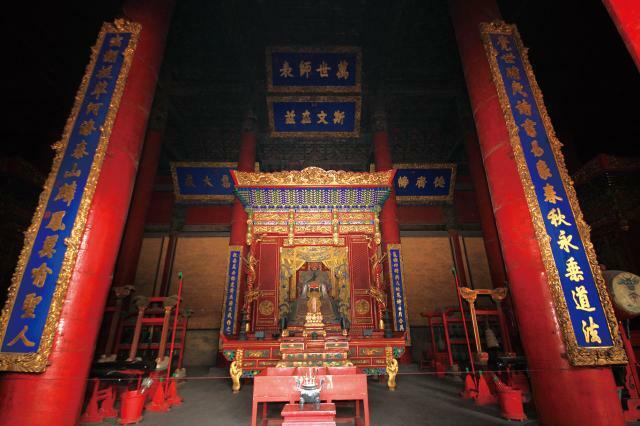 Inside, the temple is built with red walls and yellow bricks; elements reserved only for the emperor’s residence – a gift from the royal family representing trust and respect for Confucius and the Kong family. The south gate of the Temple of Confucius is called Lingxing Gate, taking its name from the Great Bear constellation. It was believed that Confucius was a star from heaven sent to bring guidance. Believe what you will, but during a time when the wrong architectural design choice can get your whole family executed, bestowing a name that suggests you’re an equal to the Emperor was unheard of. Started by Emperor Gao during the Han Dynasty in 205BC, years after the death of Confucius, emperors would still visit the Temple of Confucius with offerings to the teacher of their ancestors after successful battles, believing that without the wisdom of Confucius, they would not have been able to outwit their enemy. Immediately outside the Temple of Confucius is the Confucius Mansion, his former residence. Originally, his residence was located where the temple now stands, but it was relocated to make room for the temple during the Ming Dynasty (1368-1644). Before you get shocked by how 152 buildings with 480 rooms were relocated, the original mansion that was moved was much smaller than the one today. Very similar to the royal family but without the fear of being overthrown, the Kong family was a large and close family. While Confucius might be a part of ancient history, his descendents continued to play roles in China’s modern history, and the Confucius Mansion served as the actual home of his descendents until 1937. Every generation, one of his descendents would be given the title of Duke of Yansheng, which meant they were given the task of upholding the family ceremonies, and this carried on for 77 generations. If you were a son of the Kong family the teenage “you can’t tell me what to do” tantrums were out of the question. But don’t feel too bad. Being a scion of Confucius meant that you were basically guaranteed a high-ranking job. In more modern Chinese history, the Duke of Yansheng held government positions, most commonly in education. The final of three of the San Kong is the Cemetery of Confucius. Visit on a rainy day and it quickly becomes one of the eeriest places you’ll ever visit. Locals still visit the cemetery to pay respects to Confucius. While we were there, the local guide told us that particularly before China’s notoriously hard university entrance exams, the cemetery is packed with people praying to Confucius for that little bit of an extra boost for their kids. The cemetery is essentially a forest. Sitting on 183 acres of land, it’s the final resting place of 4,003 of Confucius’ descendents, former students and nobles. Tombstones of different shapes and sizes and animal statues are everywhere. It’s essentially a forest of tombstones. During off-peak seasons, the cemetery is quite tranquil. Would I recommend taking a stroll there like it’s your neighborhood park? Not really. I couldn’t help but think about how it’s one of the worst places to be in the event of a zombie attack. Try outrunning generations of the wisest minds in China. Good luck. In Qufu, the Kong family lived like kings. During his lifetime, royals and nobles from around China would beg Confucius to study with him. They’d bring gifts and send servants to his home as a sign of respect. His home became a melting pot of Chinese influences from art to cuisine. This gave life to a culinary culture and philosophy that’s uniquely Qufu. And when it’s time to take a break, you’ll find restaurants promoting the age-old concepts of healthy eating that Confucius promoted, focusing on ingredients that are fresh, in season and healthy cooking methods. Local restaurants also cook up savory northern Chinese dishes while combining them with the delicate flavors of southern dim sum. In a way, the first fusion Chinese dishes came out of the ancient sage’s kitchen.